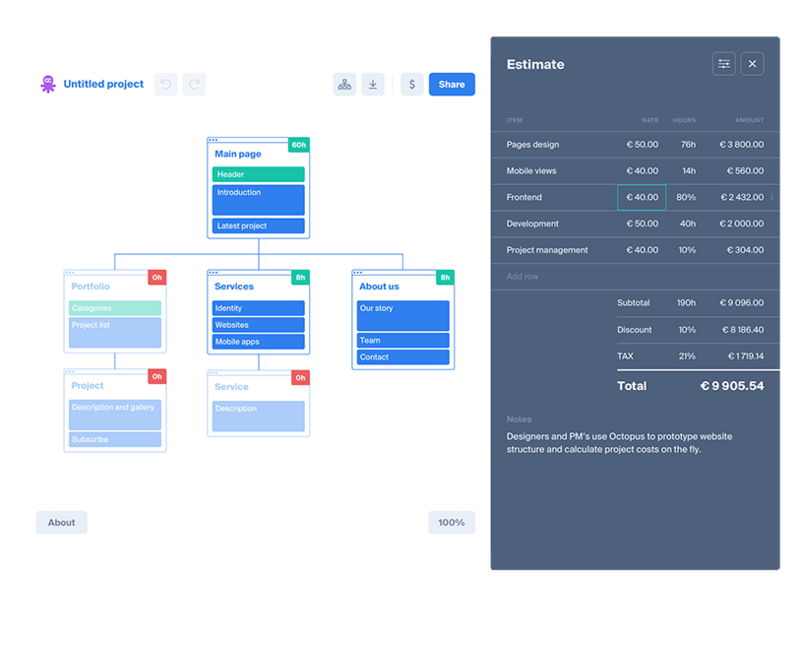 Octopus.do visual sitemaps and estimates. and app structures, calculating project costs on the fly. It’s lightning fast and easy to use! From the big picture down to the smallest parts of every page. Prototype future project sitemap linking pages to each over and dive deeply adding colored blocks to show contents. Estimation panel allows to input necessary hours to design each page or screen. All hours sum up in the table's first row, allowing to set hourly rate, add extra stages to the project and calculate total costs. From the big picture down to the smallest parts of every page. Prototype future project sitemap adding coloured blocks to show every screen contents.